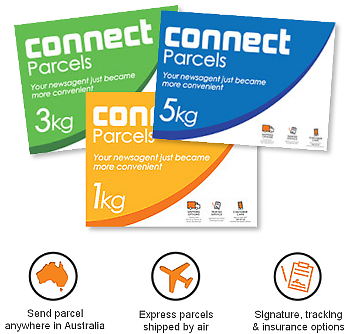 You can send parcels at Mackas Griffith Newsagency to anywhere in Australia through our CONNECT Parcels service. CONNECT will ship your parcel next business day* with signature and online tracking included so you know exactly where your parcel is and when it has arrived at its destination. Our Express parcel delivery service has all parcels being shipped by air. CONNECT also offers a 1kg Economy service with a 3-5 day delivery time. Customers can send their parcel in either a 1kg, 3kg, or 5kg satchel to anywhere around Australia. * Next Day Delivery is for metro to metro only. Regional areas may take 2-4 days.